The Agricola is a book by the Roman historian Tacitus, which recounts the life of his father-in-law Gnaeus Julius Agricola, an eminent Roman general. It also covers, briefly, the geography and ethnography of ancient Britain. As in the Germania, Tacitus favorably contrasts the liberty of the native Britons to the corruption and tyranny of the Empire; the book also contains eloquent and vicious polemics against the rapacity and greed of Rome. This translation by Alfred John Church and William Jackson Brodribb, was first published in 1877. The Germania, is an ethnographic work on the Germanic tribes outside the Roman Empire. 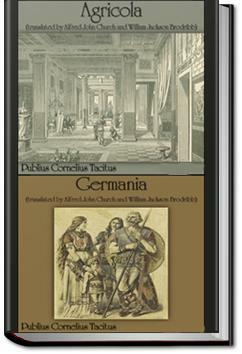 Germania fits squarely within the tradition established by authors from Herodotus to Julius Caesar. Tacitus himself had already written a similar essay on the lands and tribes of Britannia in his Agricola. The Germania begins with a description of the lands, laws, and customs of the Germanic people; it then segues into descriptions of individual tribes, beginning with those dwelling closest to Roman lands and ending on the uttermost shores of the Baltic, among the amber-gathering Aesti, the primitive and savage Fenni, and the unknown tribes beyond them. Tacitus is most famous for his Histories and Annals, but three of his shorter works also survive. The Agricola and Germania are his first books, published in AD 98. Akıcı bir şekilde okunabilen bir tarih kitabı. Yalnız okurken şunu göz önünde bulundurmak lazım; kitap Romalı bir tarihçinin gözünden subjektif bir şekilde yazılmıştır. I'm not a big fan of the Romans, so it's unsurprising that one of the few Roman texts I've read cover to cover isn't even about the Romans themselves - it's mostly about barbarians. They ravage, they slaughter, they seize by false pretenses, and all of this they hail as the construction of empire. And when in their wake nothing remains but a desert, they call that peace. For fans of the great Roman historian Tacitus who gave us "The Histories" and "The Annals," his two short works, "Agricola" and "Germania" will give you a mild fix. I don't read a lot of classics anymore (probably from having to binge on them in grad school) but these short works were both engaging and enjoyable. Like a lot of ancient writers, Tacitus is something of a jack of all trades.